ACCIONA,a Spanish multinational that operates in the infrastructure and renewable energy fields, will take on the challenge of the Dakar Rally for the third successive year with the only vehicle in the race that will not consume a single drop of fossil fuel. With this new participation in the mythical race, ACCIONA will once again demonstrate the capacity of clean energies as a competitive alternative to fossil fuels. All the other competitors will consume around 25 liters of fuel per 100 kilometers and emit CO2, the gas that causes global warming. The 39th edition of the Dakar will take place from January 1st to 15th along a route that will cross some of the most demanding areas of terrain in Paraguay, Bolivia and Argentina. Ariel Jatón will again be at the wheel of ACCIONA 100% EcoPowered. The Argentinian driver, who has extensive competitive experience and several participations in the Dakar Rally – he is also Argentinian champion of Rally Cross Country - has worked with the team on some of the improvements to the car. His navigator for this edition will be his countryman Tito Rolón. This initiative by ACCIONA, to raise the profile of caring for the environment and the fight against climate change, is in line with the recent entry into force of the agreement signed by 195 countries in the Paris Summit last year. 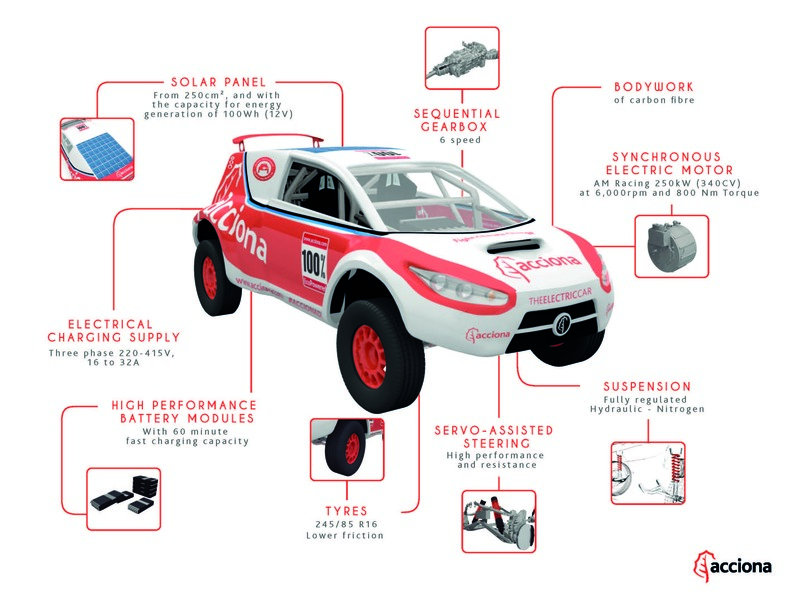 ACCIONA 100% EcoPowered is the result of ongoing research and development by the R&D+I department of ACCIONA since the car was initially designed in 2012. It is the electric car with the most available power in the world (250 kw), equivalent to a 340 CV combustion engine, thanks to an innovative power train consisting of a synchronous electric engine, a series of six on-board fast-charge batteries (charging time 60 minutes) and a system that feeds the safety instruments through a high-performance solar panel with a nominal capacity of 100 Wh. For this edition, some technical improvements have been incorporated to increase the car’s reliability in comparison with last year’s model. These include changes to the chassis design, lighter batteries, a six-speed sequential gearbox and the development of its 4x4 traction system.